A chance to learn how to regenerate farm and garden systems using home produced Biofertiliser, Native micro organisms, Aerobic and Anaerobic compost teas. Over the course of the day we will be collecting native microbes to make cheap but effective natural fertilisers and tonics for the plant and soil. The day will be practically orientated although there will be a chance to discuss and learn some principles, objectives and strategies of Regenerative Agriculture. CLICK HERE to see a guide of course layout for the day. By the end of the day you will have the practical knowledge to make your own preparations at home, and a ‘starter kit’ of resources to take home with you including a fresh and mature batch of native microbes and biofertiliser for diluted use. "Good mix between technical and practical, science and simple!" J uanfran Lopez has studied with the Columbian Jairo Restrepo, one of the leading teachers of microbial preparations for healthy biological systems. Juanfran has also travelled through South America, Africa and Spain specializing in regenerative agriculture, learning and teaching as he travels. He was based at Ragmans researching and running trials on our orchards and garden. Analysis and discussion of these trials will also be available on the course. Who should attend: Gardeners and small scale growers and farmers. "I have a good basis now on how to and what use can be applied. 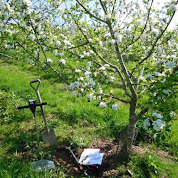 Excited to try"
"Great all round picture of soil biology to support understanding of practices"
"Great environment with practical demonstrations, as well as academic. Enjoyed it and learnt loads"
"Can't wait to get started"
For further information on making biofertilisers do have a read of our article "Make your own Biofertiliser"published in the Permaculture Magazine. Also plesae have a look at our Research section on the website - it's not extensive, but it may be helpful!